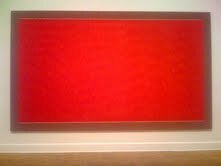 For those who love color and the city of Washington there is a rare treat - a show at the Corcoran Gallery of Art featuring artists associated with the Washington Color School. Among them Gene Davis and Thomas Downing who were both based in Washington, DC. Washington Post art critic Paul Richard who spoke last week at the Corcoran said he could see some pastel yet vibrant colors of the cherry blossom festival in the paintings of Gene Davis and others from the Washington Colors School. He said their art was so unique to the DC area and so different from the paintings of their NY contemporaries from the abstract expressionist movement. 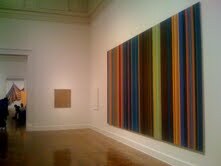 Well, I just loved to stare at those large scale paintings at the Corcoran. Some of them take up almost the entire wall of the exhibition hall. 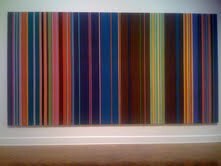 I could see that the individual colors were really defined by their interaction with the others.